These individual salad stacks can be filled with any salad ingredients! These are filled with the favorites from Caprese, Greek, and Antipasto salads. I keep a small notebook in my purse, when I carry a purse, to jot down ideas, drawings, names, ingredients, etc. 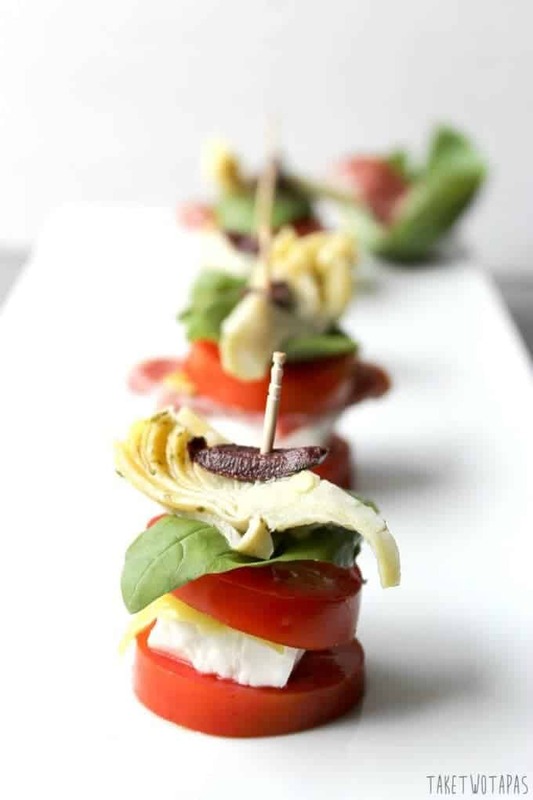 The idea for these salad stacks came from a stacked Caprese salad that I saw in a magazine. I love food magazines as I have said before, and my bookcases are overflowing with them. My husband wanted me to get rid of them and go digital, but there is something inspiring about touching the pages and reading the words. Boo on him! Once I saw the picture of the Caprese salad, I immediately thought of a Greek salad and started writing notes about it. Oh, how I love a Greek salad. The saltiness of the feta, the brininess of the olives, the pickle of the pepperoncini. They hit all the right notes. Not to say I don’t have love for a Caprese salad with the creamy mozzarella and earthy basil. One other salad I can’t get enough of is an antipasto. I love eating all the olives, roasted peppers, and that salami! These salads have so many great “add-ins” that they make me feel like I’m actually eating a meal and not just some “fru-fru” rabbit food. When you are ready for these cute salads, gather all your favorite parts of the Greek, Caprese, or Antipasto that you like! That’s one of the best things about these salads is that you can make it your own! Make all the necessary cuts and stack as you like! Each one of these stacks is its own version of the three salads above so I had a hard time coming up with a name. It’s not an actual Greek salad, or a full-on Caprese, or even an antipasto if you want to leave off the salami and go vegetarian, so I am going to call them Mediterranean so I don’t leave any regions out! Another good thing about these salad stacks is that you don’t need a dressing. I used a simple balsamic reduction to dress it up and provide a slight amount of acidity and sweetness. Each of the ingredients has their own unique flavor and I didn’t want to lose that by covering it with a dressing. You can buy the balsamic reduction/glaze already prepared in your vinegar section. Feel free to make your own by reducing balsamic vinegar in a saucepan over medium heat until thick like a syrup. Don’t turn your back on it though, I have burned quite a few batches before. I usually keep a bottle of the reduction on hand for garnishes or when I run out of dressing I just squirt some on my greens. It’s also great on strawberries or ice cream! 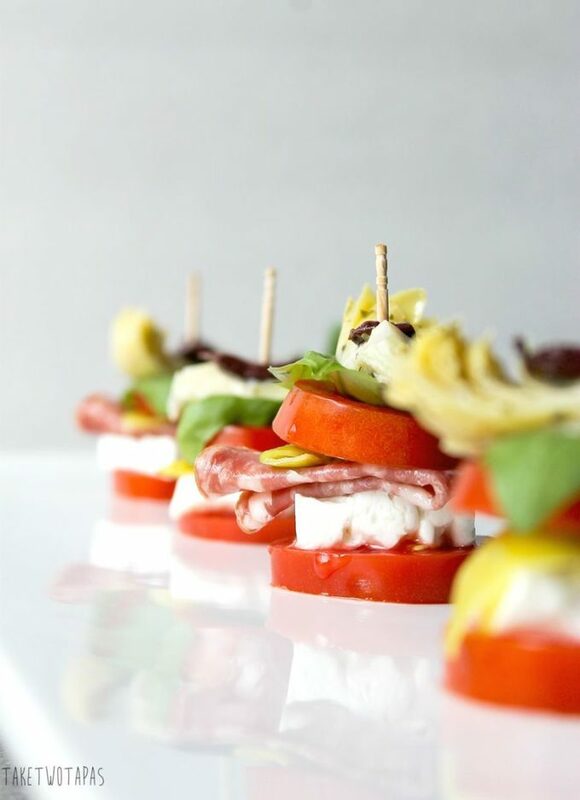 These fun Mediterranean salad stacks are great for a picnic or make a first class presentation at your next dinner party! When ready to assemble, start with a tomato slice on the bottom. Layer your favorite ingredients and then top with another tomato slice. This is such a creative way to serve a salad! And such a colorful presentation! Love this, what a fantastic idea! Salad stackers are such a welcome sight at parties. Gotta balance out all that cheese! My thoughts exactly! I hope you get the chance to make them soon! What a great idea for a dinner party. Love these ingredients and they are perfect year round. Thanks Ali! It’s definitely a great appetizer! Adorable and they looks so tasty too! I also keep several notebooks on hand and constantly write as well as keep notes digitally. There is just something about the act of writing it down that helps my creativity more! What a fun and delicious tapas idea! One hand for a tapas and the other for my favourite glass of wine. This is perfect and so easy. sharing and pinning all over, of course! I’m all about the wine in one hand and food in the other! Good thing they are on sticks:) Thanks so much for reading and linking up! These look delicious, and so pretty! 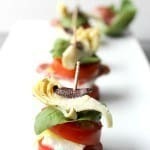 I totally made antipasto skewers today for a post next week and everyone loved them. Something about miniature food makes people go crazy haha! I know! It’s just fun to have bite-sized food! Plus you can try so many things without getting full too soon! Such a fun appetizer or mid day snack! I love the name – fits them perfectly. Thanks Kimberly! They are cute and fit great into a lunch box too! Balsamic vinegar makes everything better! Those look fantastic! Thanks Laura! I use it on so many things! Even ice cream! Love this idea! 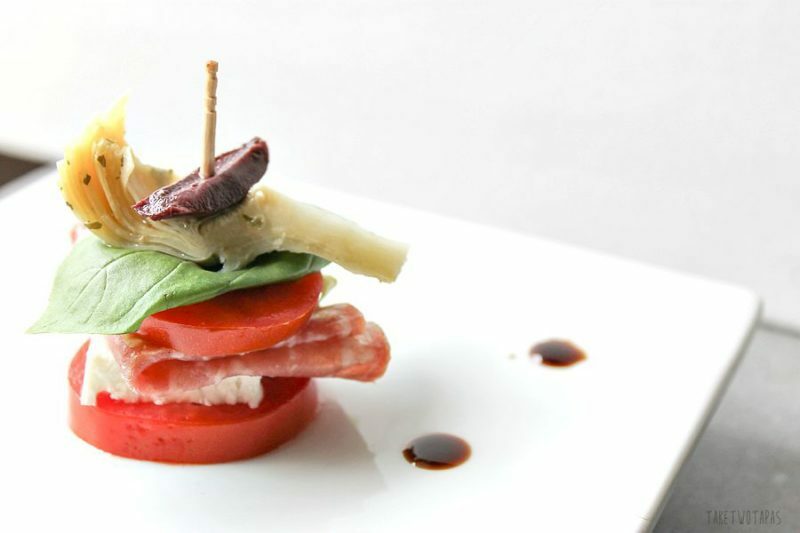 Several years ago I had a version of a stacked caprese in a restaurant in Prague that was called a “neopolitan caprese”. It wasn’t traditional completely in the ingredients uses, but it had this stately look to them–and so simple to make! Thanks for reminding me of new ways to use ingredients I have on hand! What a great name! I wish I would have thought about that! Might have to file that away for another stacked app! I certainly need to eat more salads and if I can make them fun and change up the ingredients, even better! Mmmmm, all my favorite things on one toothpick! I don’t think I’d be able to control myself if I saw a plate of these at a party. Yum, as I think that was what you were starting to play around with last time I visited. The flavors each component brought to the salad was mouth watering! Keep them ideas coming. Thanks MOM! I’ll make them for you!